Walkers Haute Route Classic. Guided walking holiday from Chamonix to Zermatt. This is the classic Walker's Haute Route trek. We hike the entire journey from Chamonix in the French Alps to Zermatt in the Swiss Alps. Our journey takes us through amazing and varied alpine terrain as we cross mountain passes up to 3000 meters high. 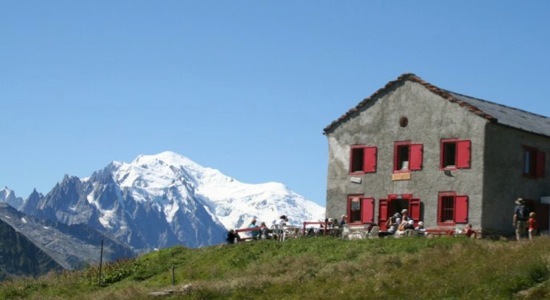 Along the way, we stay in mountain huts in superb locations and hotels in charming alpine villages. The Haute Route trek is bursting with great walking trails, breath-taking mountain views and fascinating mountaineering history and is a must-do for strong walkers. Arrive Chamonix and meet with your guide in the afternoon for welcome, equipment check and a day-by-day briefing on your Haute Route trek ahead. At night, you're free to explore the many bars and restaurants in Chamonix at your leisure. From La Sage we have a long day ahead. We ascend through Swiss mountain pastures to the Torrent mountain pass. Descending from the pass, we keep an eye out for the rare edelweiss, which flowers in this area. The descent takes us to the beautiful Moiry lake and dam where a cafe provides refereshments before our second climb of the day. This time, our climb takes us to the Sorrebois pass and we descend to Zinal with the help of a cable car. Suitable for mountain walkers with a high level of fitness and stamina and an adventurous spirit. 8 nights nights in hotels, 1night in auberge and 2 nights in mountain huts. From 4 to 10 clients with 1 certified English-speaking guide (UIMLA). Add one or more extra days in Chamonix or Zermatt at the start or end of your trip. Contact us for details. This trip is available as a private trip. Contact us for details. This trip is available as a self-guided trip. Click here for details. "Flawless planning and organisation by Alpine Treks: we stayed in 12 different hotels/dortoirs/huts on this tough 14 day walking holiday with no problems. Our small group of 5 was led by guide Robert Farwell who is competent, knowledgeable, and good company. Thanks to Alpine Treks for a memorable experience." "My wife and I recently enjoyed a very memorable hike of the Swiss Alps guided by Alpine Treks. We experiences a challenging, yet relaxing hike, with top notch accommodations, food and a knowledgeable and friendly guide (Thank you Robert). We were paired with other hikers with similar skills and backgrounds. The group chemistry was way more than we hoped for and we believe most of it was due to great planning and organization by Alpine Treks. It is a tribute to the guide (and Apline Treks) when you can totally enjoy the views, company and accommodations without a single worry. Great Job - we highly recommend using their service." "I signed up with Alpine Treks for the Haute Route (Chamonix to Zermatt) trek with a friend and we really lucked out. We had a compatible group of five with a very knowledgeable, competent, French and German speaking guide (Robert Farwell). He was especially helpful to me when the soles came off my boots after two days (in spite of pre trek repairs) and I had to buy some new ones in Champex. We had a week of glorious weather and only 2 rainy days in 12. The views were spectacular. There were no logistical problems at any of the hotels or mountain huts. It's a strenuous and occasionally challenging hike and fortunately everyone was up to it, as it would make a big difference to the experience if there were different levels of hiking ability in the group. Definitely recommended."